And yup…another word battle that ends with Koyomi getting brutally disfigured. Then Shinobu arrives to bail him out…where have I seen this before? Nisemonogatari perhaps? Probably because of the time constraints of a movie, Neko is far more serious, it would seem. So I guess if you watch Bake for the comedy, there probably isn’t all that much here for you, but if you watch for the incredibly verbose dialogue, then this works just fine. That’s about it for this one, I guess…bring on the Kizumonogatari. I should be safe watching that one, right? The second season that’s advertised at the end of the movie…maybe more dangerous. I’m starting to get the feeling the light novels would be the safest option. But that aside, this works as a prequel for Bakemonogatari, but I’m hoping Kizumonogatari is better…not much more than that. If you were expecting some shot of the cat, then you really don’t know how I operate. The last part will likely have to wait until tomorrow…all that remains is the final confrontation, I would assume. Interesting seeing Oshino actually having troubles with a monster…guess we need Shinobu(right?) to save the day. This part of the movie is heavy on the details, which are interesting because they go more into the supernatural world of the show, but don’t give too much to write about. I think it’s funny that Koyomi won’t even dare touch the cat, though…what a weakling (yes, I’m aware he’s not a full vampire). Starting off Nekomonogatari with a discussion about love that actually turns out to be sexual frustration…sounds about right. Pretty funny episode, I guess…was fondling his sister really necessary, though? 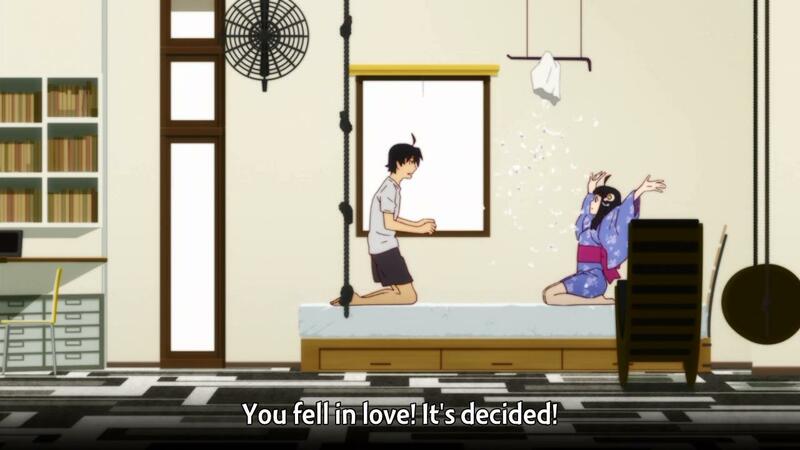 I guess Araragi Koyomi is back with the prequel story revolving around Hanekawa Tsubasa, the cat girl. My memory of Bakemonogatari is pretty fuzzy, so I don’t really remember what clues they gave us…or maybe I just wasn’t paying attention. All I know is that so far, everything seems pretty standard. Although I find Tsubasa’s behavior a bit odd for some reason. Anyway, I’ll wait to see how the rest of the episodes are released before deciding on how I’ll cover it (it’s not that long as far as I can tell)…I figured that today, I would just do beginnings for this show and Kokoro Connect. I will say that I liked the opening song…it fits the character pretty well and it’s a nice song…nothing too crazy.